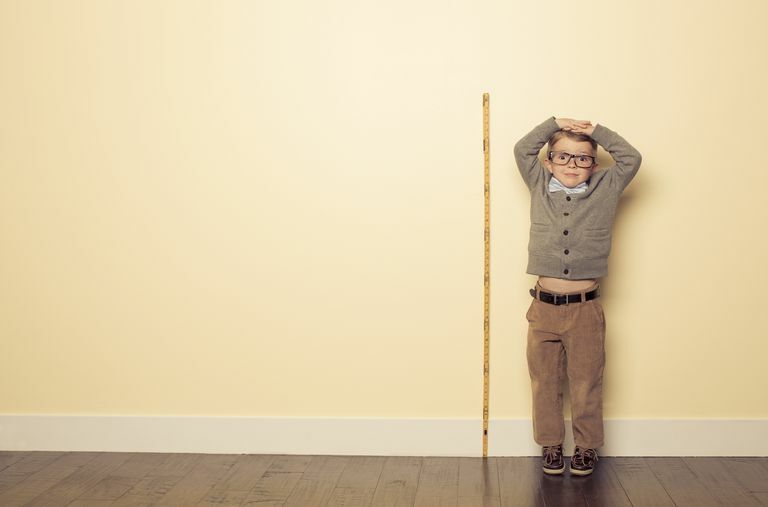 When Is Adding an Inch or Two to Your Child's Height Worth It? It can be hard not to be concerned when a child seems substantially shorter than other kids his age. And in rare cases, short stature can be something to worry about, particularly if a child's rate of growth slows down suddenly for no apparent reason, or he seems to stop growing altogether—in other words, he develops at a steady rate but suddenly falls off the growth curve. For example, if a little boy is in the fifth percentile for his height (meaning that 95 percent of boys his age are taller than he is), that is not considered a problem in and of itself. If, however, he goes from the fifth to the first percentile, a number of things could be going on. He could have a genetic disorder, an underactive thyroid gland, or even a medical condition that's impacting his development. Usually, though, a child who's lagging behind his peers in terms of height has a condition called idiopathic short stature, meaning shortness occurring for no known reason. Since this isn't a health problem, there's not much to be done. In some circumstances, though, parents may opt to treat a short child with growth hormone therapy, a long-term treatment that stimulates growth in children who either have a specific hormonal deficiency or a health condition that prevents normal growth. Hormones are chemicals produced by certain organs of the body, most predominately the endocrine and pituitary glands. The pituitary gland is the one responsible for making the hormones that promote the growth of body tissues. Growth hormone (GH), also known as somatotropin, is one such hormone. It stimulates growth by raising the concentrations of glucose, free fatty acids, and IGF-1 (a protein central to childhood growth). This allows cells to regenerate and build muscle, bones, and other vital tissues. Other hormones produced by the pituitary gland that contribute to normal growth and development include thyroid-stimulating hormone, adrenocorticotropic hormone, and follicle-stimulating hormone. In 2003, The U.S. Food and Drug Administration approved the use of GH for children in the bottom 1 percentile for height for their age group or for failure to grow due to chronic kidney disease, Prader-Willi Syndrome, Turner's Syndrome, Noonan Syndrome, and other medical disorders. Growth hormone therapy is a long-term commitment. Growth hormone is given on a daily basis by injection, although for certain conditions as few as three shots per week may be necessary. Most of the time treatment is prescribed over the course of several years and can go on for as long as there is a potential for growth. In addition to growth hormone, a child may need to receive other hormones to keep his overall hormone levels balanced. It can get pricey. The cost of growth hormone therapy can run anywhere from $10,000 to $40,000 per year and is rarely covered by health insurance unless it's needed as part of treatment for a serious medical condition. Even then, it may take a lot of arm-twisting to get your insurance company to approve long-term treatment. GH therapy won't make your child basketball-star tall. If you're considering growth hormones for your child, it’s important to discuss your expectations with your doctor, including how much height your child might gain—on average growth hormone therapy can add between 1 to 3 inches as a kid nears adulthood. Your attitudes about shortness along with those of your child also are important to factor in when deciding if growth hormone therapy is a smart option. If you have negative feelings about short stature, no amount of growth hormone can alter them, so if your child is otherwise healthy, you may not want to treat him. If you do, it may still be important to focus on boosting his self-esteem: Growth hormone therapy will make him taller than he might have been without it, but he may still be shorter than average.